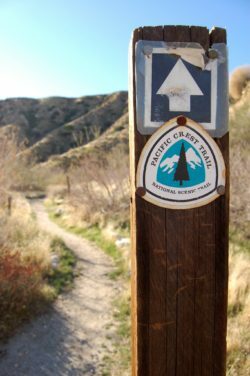 In April 2018 I begin my solo trek of thru-hiking the Pacific Crest Trail. What this means is I’ll be setting foot on the trail at the southern terminus in Campo, Calif., at the Mexican border and hiking 2,663 miles through California, Oregon, and Washington, past the northern terminus and into Manning Park, British Columbia. You heard right – 2,663 miles. This thru-hike will take me roughly five months to complete, so as you can imagine, a significant amount of research and planning is involved. I’ve committed to temporarily leaving my current routine behind to experience a simpler way of life. I’ll be walking 8 to 12 hours per day as if it’s my job while carrying everything I could possibly need on my back, including one week’s worth of food at a time. My bedroom will be downsized to a two-person tent, not to mention an ultralight inflatable pillow that could be considered a luxury item. My feet will ache daily and blisters will become my best friends. Daily water will be enjoyed only after filtering. A shower, clean clothes, and fresh food will be a weekly to biweekly extravagance. Not to mention that getting to these things will require additional work by walking or hitching a ride into town. The simple answer – I love nature. I want to experience a life outdoors.